Martin Hayter Short CM (born March 26, 1950) is a Canadian-American actor, comedian, screenwriter, singer and producer. He is mostly known for hosting Second City Television and Saturday Night Live and for making the voice of Cat in the animated series The Cat in the Hat. He has won 3 Emmy Awards and a Tony Award during his 40 year career. Short was born and raised in Hamilton, Ontario, Canada on March 26, 1950. He was educated at Westdale Secondary School and at McMaster University. He was married to Nancy Dolman from 1980 until her death in 2010. They had three children together. He currently lives in Pacific Palisades, California and Lake Rosseau, Ontario, Canada. ↑ "Martin Short Biography (1950-) at FilmReference.com". filmreference. 2008. Retrieved June 9, 2008. ↑ Natalie Finn (August 23, 2010). 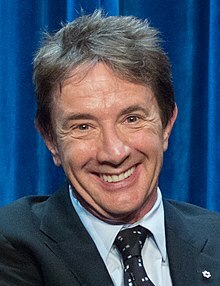 "Martin Short Loses Wife to Cancer". E! Online. Retrieved August 23, 2010. Wikimedia Commons has media related to Martin Short. This page was last changed on 30 July 2018, at 07:30.